It’s been a rather busy week in our house. Lots of errands over the weekend, three dinners out planned for this week. For now, a glimpse of a favorite meal from this last week, eaten at La Mexicana Bakery and Taqueria. Last Saturday, we had a party where we served Mexican food. I even invested in a tortilla press and tried my hand at making fresh tortillas. Unfortunately, despite my best efforts to prepare in advance, I was too busy and too tired to take pictures to generate a blog post. But armed with a new tortilla maker and some left over ingredients, I wanted to try to make more Mexican food. I haven’t made a lot of Mexican food previously. When we lived in California, Mexican food was omnipresent. They even served passable tacos at the corporate cafeteria. In northern Virginia, good tacos are few and far between. Given that there were shrimp in the freezer, shrimp tacos seemed a wise choice. These tacos are very easy to make. The cooking of the shrimp is somewhat unconventional but it does work. Given the flavoring of the tacos, they would be just as good, if not better, served either at room temperature or chilled on a hot day. In a sauce pan, combine the water, black pepper, allspice, and bay leaves. Squeeze the limes and add them to the sauce pan. Bring to a simmer, cover, and simmer for 10 minutes. 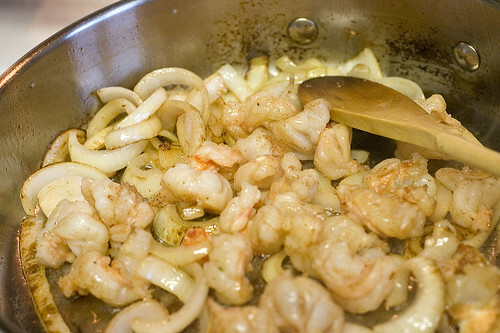 Uncover the sauce pan, turn the heat to high, add the shrimp, cover, and bring to a boil. Remove the sauce pan from the heat and drain off the liquid. Keep the pan covered and set aside for 15 minutes. Peel the shrimp and cut them into 1/2″ pieces. 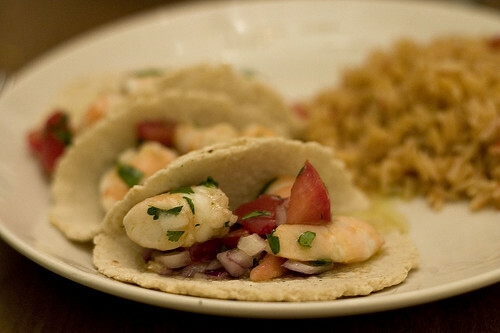 Combine the red onion, tomato, and cilantro in a bow with the shrimp. 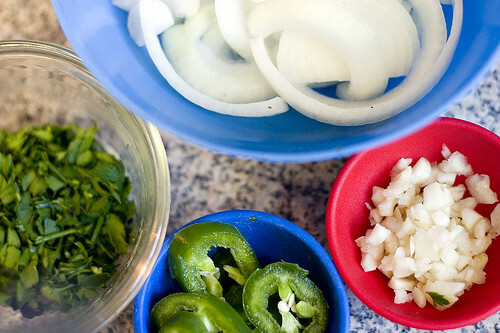 Whisk together the lime juice, olive oil, and vegetable oil. Pour over the shrimp mixture. 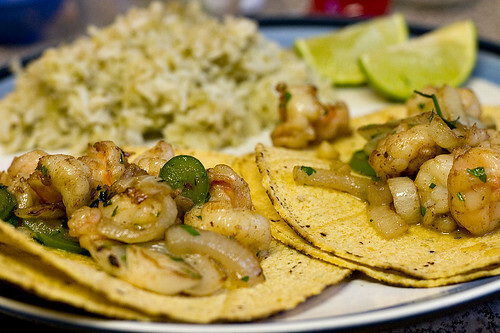 Serve the shrimp mixture in tortillas. It’s been awhile. It’s been quite awhile. I could blame it on a number of things but suffice to say that I’m back. You may remember that we recently moved from southern California to northern Virginia. 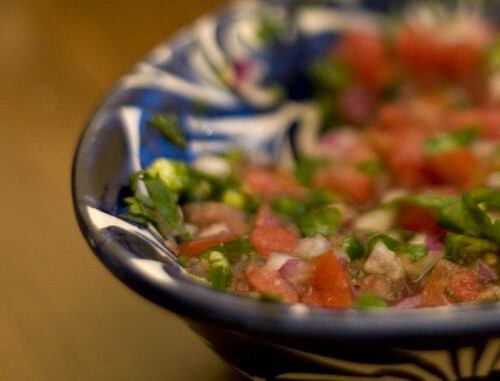 Unsurprisingly, northern Virginia isn’t exactly a mecca for Mexican food. My personal Mexican food of choice is carnitas and, unfortunately, the closest I’ve found so far in our new home is at Chipotle. So I decided to make my own. 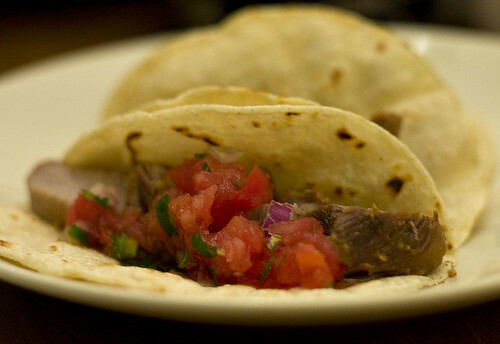 These aren’t the more common carnitas found at taco stands around L.A. These aren’t cooked for the same length of time so they don’t easily get the shredded texture of taqueria carnitas. Instead, they are rather quickly simmered in milk before cooking the liquid off. 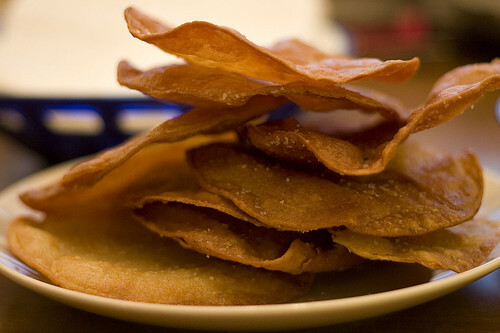 They’re reminiscent of an Italian recipe where pork is slowly cooked with milk. They are quite flavorful; almost intense, as Angela described it, but at the same time mild. The salsa (in the pictures) almost overpowered the flavor of the carnitas and I omitted it for the remainder of my tacos. The only downside for me was that the texture was different than I was expecting. Something that shreds more easily would work better on tacos. These cook quickly. Quick enough for a week night. They go well with homemade tortilla chips and salsa. The leftovers work well in quesadillas. Dry the pork with paper towels and season with salt. Heat the lard in a wide, heavy pan until hot. Add the pork and fry until lightly golden, turning occasionally, about 8 minutes. Add the onions and cook until the meat is well browned, about 8 minutes more. Add the remaining ingredients, bring to a simmer, cover, and cook over low heat until the meat is cooked through and tender, 20 to 30 minutes. Remove the lid, and increase the heat, cooking until all the liquid has been absorbed (there will still be a lot of fat remaining). Remove the meat from the pot and let rest for 5 minutes. Slice the meat into small pieces and serve with corn tortillas.